Table of Contents - To go straight to my genealogy database skip down to the "Hot Links" below. Welcome to my family genealogy web site. Hopefully you will find something that will contribute to your own family genealogy research. I have been researching my family line for a decade or more and feel as though I have just begun. My database, which you can access below contains 3,568 individuals, and 1,283 families. The primary families that I am researching are Trueloves/Truloves, Tutors/Tudors, Weathers, and Browns who's origin was in north western Harnett County, NC. My wife's family, theArenas and Bacarellas came from Borgetto, Sicily to NYC in the early 1900s, then to Hopewell, NJ. I also have a collection of Truelove databases sent to me by other researchers that contain some duplication, but also have many families that I do not have in my database. My intent is to consolidate all of these databases into one database (including duplicates) to simplify searches across multiple databases for individuals, and place them into a separate set of web pages from my family group to allow you to access and search both databases from this web page. The web based HTML genealogy data base that I provide links to below takes some getting use to, to effectively navigate. Nevertheless, there is quite a bit of information available to you, and I would very much appreciate your comments, corrections, and suggestions. The database is a work in progress, so you may well find typos, incorrect spelling, and some family member information that needs correcting. Many people have generously contributed additional information, and has helped me to improve the accuracy of the overall database. The genealogy information resides on Family Origins' database, which is used to generates the web pages containing genealogy information. Therefore I have no control of how the pages are created. Each of the "hot links" below (shown in blue beside a red ball) will take you to a specific web page containing genealogy information. Be aware that when you click on a "hot link" to find information, such as the example of viewing my Truelove genealogy records you will click on "Index to Gene Truelove (name is actually Perry Eugene Truelove in database), which will take you to the beginning of the genealogy web pages (html files) containing records with a series of names, but not directly to my name. As you go into each web page you simply page back/forth till you find the person you are looking for. Once you understand/master how the information is organized, your ability to find individuals quickly will greatly increase. You also can use "find/search" feature of your browser to find specific information on a web page. If you have genealogy software, then may want to use the Download HOT LINK to down load the entire data base to your computer desktop. Once you Double Click on the Download HOT LINK you will get the GEDCOM file loaded into either a TEXT or WordPad file--whatever filetype you assign to the GEDCOM file download. If you have not assigned a filetype for GEDCOM Files, then the browser will ask you to make an assignment. At this point you want to assign GEDCOM files to ".TXT" filetype. Save the downloaded file to your desk top, then go into your genealogy software and import the GEDCOM file by pointing your genealogy software to the file you just downloaded. It will have the name and filetype of "GENETRUELOVE.GED." Instructions on how information is organized. (Tag lines have a red balls by them). You might want to just go directly to the tag lines now and start your search, then come back to the instructions if you feel you need to. To find Perry Eugene Truelove, Sr. you would click on the first tag line "INDEX" hot link, then scan thru the web page till you come upon the name. Names are alphabetically listed. If you are looking for a particular name, then the second tag line "hot link" is the one to use. All names are listed in alphabetical order. By double clicking the name it will take you to that person's information. A very straight forward process. The third tag line is probably the most difficult to manage, but can be useful if you are more or less browsing thru the web pages looking for information in general. Each page is in alphabetical order, and individuals appear in groups of 50 (this is done for those with low speed Internet service) which contain spouse, and children with "hot links" to where you can find more detail. At the bottom of each page (where to linked to) their is a "hot link" that will take you to the next 50 names. The fourth tag line is very simple and straight forward. Here are all the SURNAMES names in my database listed in alphabetical order. Click on the surname name you are looking for and you will be taken directly to the page containing that name. Page back/forth till you find the name you are looking for. The source file (where I found the information) is provided, but needs some work to get into the proper condition for Family Origins to make this information useful. Where there are references to source information, you can check the source file to get some detail of where the information originated. Tag line six has already been explained above. You simply double click on it and my entire database will be downloaded to your computer. Be aware that GEDCOM files are distributed in TEXT format, so you can view GEDCOM files with any word processor, TEXT editor, and WORDPAD. My GEDCOM file is large, and may take some time if you have a slow (low speed) Internet service. 6. Download a GEDCOM file of this data (595,082 bytes) Use the download to create your own personal copy of my genealogy database..
Truelove Family Photo Christmas 2004. 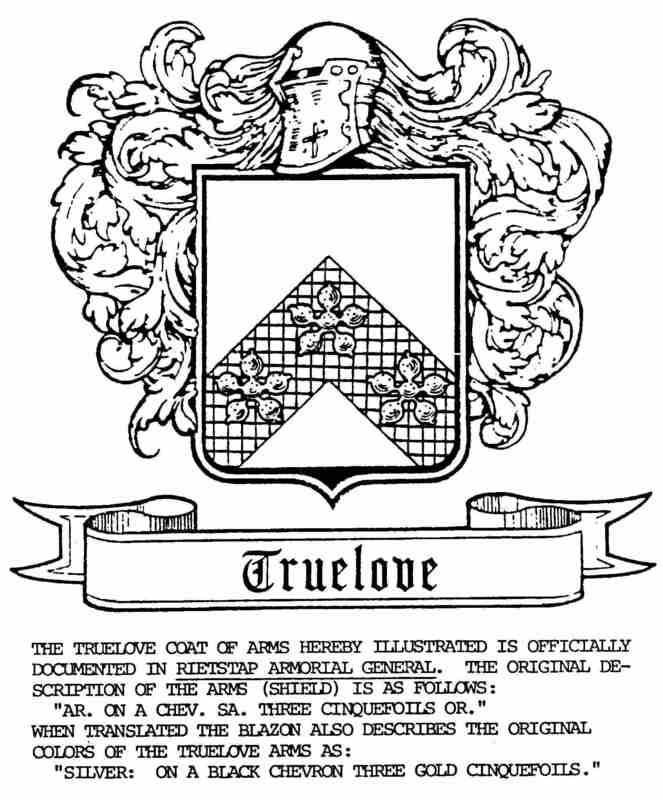 Truelove Code of Arms. The coat of arms was obtained from research I did from a source in England that contained all of the registered code of arms during the early history of England. 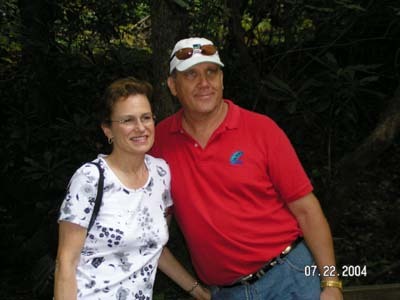 The SurnnameWeb Site you can search other resources for family names, place notes on message board, etc. Contact me for more information. Hope to hear from you. I am collecting and building a genealogy database from GEDCOM files send to me by other researchers. Please share your research information with me, and I will be happy to provide you with the consolidated database containing my collection.